You may not be a designer. You are a Nurse. Very few Nurses have the ability to create a high quality logo or design. Would you let a marketing expert do your nursing job without any training? That probably wouldn't work out well. Easily recover the money spent. Any money spent on quality and effective marketing tools can be easily recovered in a single case. All you have to do is put everything to work and you will most likely earn much more money than what you spent on marketing. Your marketing represents you. What impression do you want to present to potential clients? Your marketing tools are your first impression. Think of it as being similar to the way you dress. If you walk into a meeting with a quality business suit, you will instantly demand respect. However, if you walk in with shorts, a tee-shirt, and flip-flops, potential clients will not take you seriously. What impression do you want to make? Your time could be used more wisely. There is a lot to get done when starting a Legal Nurse Consulting practice. Wasting time while trying to creating your own marketing should not be one of them. Did you know that many of our Advanced Legal Nurse Consultants get cases before their marketing tools are even complete? This happens because they are using their time more wisely. They begin networking right away and setting up appointments for initial consultations. After completing your Legal Nurse training, you should start building contacts and looking for leads. Most Nurses don't know quality design. If you have to ask someone what they think about marketing tools you made, these tools are most likely not good. Even if they are terrible, most people won't give you an honest opinion. Therefore, you will be stuck without even knowing. If you have already attempted your own design, take a look at some of the most successful marketing identities and campaigns. Notice the quality and detail that goes into them. Does your marketing achieve the same results? Nurses don't now what works. You could guess what works, but you don't know for sure. You don't have access to detailed statistics and feedback about what works best when marketing to Attorneys. Very few people do. Knowing what works best comes only from marketing to Attorneys and working with Legal Nurses over a long period of time, and then gathering data about what works. It's not too late! Even if you have attempted your own marketing materials already, there is still hope. RN MARKET's Ultimate Marketing Tool Kit not only offers all the tools you need, but it provides you with a proven process for marketing your business based on extensive research with Attorneys and Legal Nurses. The Ultimate Marketing Tool Kit is only available to Advanced Legal Nurse Consultants (ALNCs). Why? 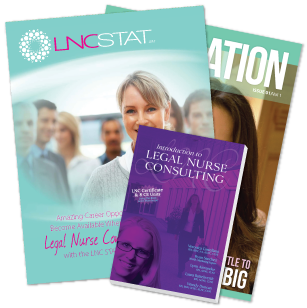 The LNC STAT course provides detailed practice and information on how to not only effectively implement your marketing, but also how to begin getting cases.